Ryan said Blueswipe is looking to leave its current headquarters at 3 S. 12th St. and head to the new digs in the summer. 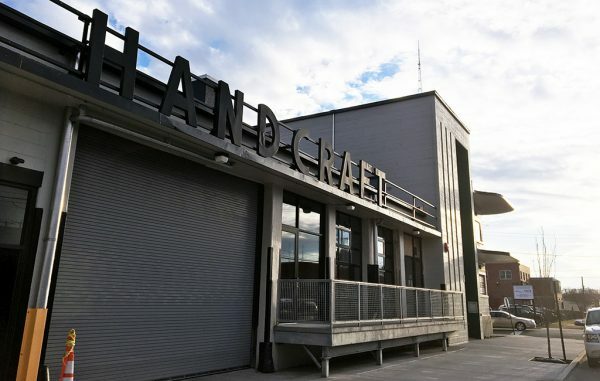 “The first time I saw HandCraft I fell in love with it; I saw us building our company there long term,” said Ryan, who founded the company in 2013. Ned Freeman, Blueswipe’s chief growth officer, said the company no longer has the space to continue growing in its current office. It has a staff of 12, with plans to add about seven more employees in 2018. Blueswipe got a taste of life in the Handcraft building last fall as a part of local startup accelerator program Lighthouse Labs, which was hosted in electric car charger maker Evatran’s office on the first floor. Evatran has been in the midst of a deal to be taken over by Chinese investors. The pending move follows a year of successful capital raises. In addition to angel funding from Lighthouse Labs, Blueswipe closed on a $450,000 fundraising round in August. Ryan said Blueswipe is designed to compete with other point-of-sale processing companies such as Square Inc. by offering small businesses a range of transaction rates based on business size and fewer monthly fees. It charges between 1 and 1.7 percent of transactions, as well as a 30-cent transaction fee. Its subscriptions range from $38 to $128 per month, based on the equipment merchants use and other features needed, such as analytics and customer loyalty programs. It also provides software to merchants that is compatible with several payment-processing hardware devices. Blueswipe’s new space is currently a white shell and will be built out ahead of its move. Ryan said it’s working on the design with local firm 510 Architects, which is also based in the HandCraft building. He said the company is looking to sublease about 2,000 square feet of the new space. Other tenants in the building include Vasen Brewing, The Fahrenheit Group, the Virginia Council of CEOs, Smither & Co. and Ferguson Enterprises. Commonwealth Commercial’s Fred Plaisted represented Blueswipe in lease negotiations. Divaris’ Cheryle Toy and Read Goode represented the landlord. Toy said there is one 5,600-square-foot space remaining in the building, for which there a few deals pending.